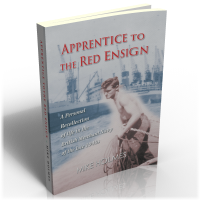 This book is a first hand account of life in the Merchant Navy as it was in the latter part of the 1940s, just after the end of World War Two. It tells of the ships that made up the huge British merchant fleet and of the men who served in them, as remembered by the author, who was one of them. The author grew up in the Berkshire countryside, far from the sea, but was educated at what was then Pangbourne Nautical College, where he learnt the rudiments of seamanship and ‘how to do things smartly, at the double’ – also developing a strong feeling about being of service to the Empire. He left Pangbourne aged just seventeen and went straight to sea, joining the Ellerman and Bucknell Steamship Company as a cadet, always known aboard ship as an ‘apprentice’. He served in three of the Company’s ships and one Royal Fleet Auxiliary store ship, which the Company manned; these being the City of Carlisle, the City of Rochester, the City of London and the RFA Fort Constantine, in all making six voyages and visiting ports in many parts of the World. In those days the Merchant Navy was the vital link, connecting the various parts of the vast British Empire, providing the means by which the lifeblood of trade could flow, and the Empire’s people travel. Among those who manned the ships a strict pecking order existed, which held discipline together. A junior apprentice started as the very lowest of the low, slowly progressing to become a trusted member of the ship’s company. The British Merchant Navy as it was in those times has long since disappeared. The Red Ensign is no longer flown by a great percentage of ships at sea, ‘flags of convenience’ are the order of the day and very few crews are British. Because it describes a way of life which has now vanished into history, this book is sure to be of interest to all those who remember life as it used to be under the ‘Red Duster’.